Salesforce offers various certifications to test and evaluate the knowledge of Salesforce professionals on various features and functionalities of the Salesforce platform. With new Salesforce certifcations coming, professionals are eager to know about the details and how they can revamp their Salesforce CRM skills in development and marketing areas. With recent announcement from Salesforce on Salesforce Developer Certification changes-here is an elaborate explanation on the roadmap to be followed to make a transition from Salesforce DEV401, DEV 501 to the new Salesforce developer certifications. Salesforce CRM systems have evolved at a rapid pace from a simple Salesforce automation package in 1999 to a best-in class CRM solution that includes sales, marketing, service, social, etc. Today, Salesforce professionals can build any kind of application on the force.com platform. As Salesforce evolves, it is necessary for professionals to upgrade their skills by taking various Salesforce certifications to manage the latest advances in the Salesforce platform. With Salesforce features and functionalities growing over time, it is becoming difficult for professionals to remain up-to-date with all aspects of the CRM solution. Depending on how a professional works with the Salesforce platform, he/she has to specialize in a particular area. Salesforce certifications help professionals exhibit their understanding in specific areas of the Salesforce CRM platform. Employers hiring for Salesforce job roles expect that professionals have some kind of a related Salesforce certification when applying for a particular Salesforce job role. Studies show that the average pay for Salesforce professionals who do not have a Salesforc certification is $69,600 whereas those with at least one Salesforce certification is $86,850. Nobody likes to hurt their earning potential and small investments in acquiring Salesforce certifications now will ensure that your salary increases on the double. The concept of a Salesforce developer is not similar to other technologies like Oracle, Java or .NET, where the developer programs an application by writing lines of code. A Salesforce developer also creates a CRM application but a Salesforce developer is skilled to develop something new even without in-depth programming. Salesforce platform has the concept of declarative development which makes it unique in comparison to other object oriented programming languages. Salesforce Certified Force.com Developer (DEV 401) certification examination tested the knowledge of professionals in building custom applications and analytics using the declarative capabilities of the force.com platform and did not include any core programming concepts. 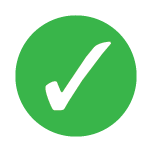 Salesforce Certified Force.com Developer (DEV 401) was a certified multiple choice exam but as the name indicated it was a developer certification and it did not evaluate any specific programming and coding skills in Apex and VisualForce. This led to some kind of dilemma for people who had not worked with the Salesforce platform, as the job role of a developer implies that one would have to code and program applications. DEV401 certification did not give a clear idea on what skills a professional possessed even if they had the developer certification. Salesforce offered another certification to test the core programming skills of professionals in Salesforce through Salesforce Certified Force.com Advanced Developer (DEV 501) which had its own challenges. The advanced developer certification DEV501 was the only representation of programming skills for Salesforce professionals but it was not a widely held certification. The advanced developer certification exam was offered only 4 times a year for close to 200 people as the programming assignment for DEV 501 required manual evaluation by several evaluators. Professionals had to wait several months for clearing the advanced developer certification which created a shortage of certified Salesforce developer professionals. As a solution to all this confusion surrounding the role of a Salesforce developer and the skills they possess - Salesforce has introduced 3 new Salesforce developer certifications. The introduction of these 3 novel Salesforce developer certification is a boon to the employers as it combats the problems employers faced when hiring Salesforce developers. The new developer certification structure helps professionals advance through the Salesforce platform in a step by step manner- beginning from the declarative certification (Platform App Builder) to Salesforce Certified Platform Developer I (Programmatic) and Salesforce Certified Platform Developer II (Advanced Programmatic concepts). Professionals who already have established credentials with DEV 401 and DEV 501 can take a free transition exam to earn Salesforce Certified Platform Developer I and Salesforce Certified Platform Developer II certifications. The new Salesforce developer certification mainly focusses on testing the declarative customization skills of the professional on the Salesforce platform i.e. the skills to create, manage and update data models, business logic, process automation and application securities. Salesforce certified App Builder certification bridges the gap between an administrator and a programmer. “Salesforce Certified App Builder” includes all the earlier concepts of DEV 401 certification but adds some new features and functionalities of visual workflow, process builder, lightning and mobile. Salesforce Certified App Builder certification also evaluates the knowledge on App deployment. It includes a section on app deployment lifecycle in an enterprise environment. Thus, professionals taking the Salesforce Certified App Builder certification must have knowledge of the standard app lifecycle, change sets, managing deployments between various environments, and the use of managed and unmanaged packages. How to make a transition from Salesforce DEV 401 Certification to Salesforce Certified App Builder? For professionals who have already earned the Salesforce DEV 401 certification, Salesforce.com offers a transition exam to the certified professionals. 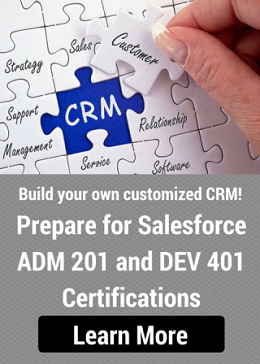 With the DEV 401 credentials, professionals can take the transition exam and upgrade their certification to “Salesforce Certified App Builder”. Salesforce Certified Platform Developer I is multiple choice exam that tests ability of a professional to develop interfaces and custom business logic by extending the Salesforce platform through VisualForce and Apex. Professionals with at least 6 months of experience on the Force.com platform can take this Salesforce certification. Salesforce Certified Platform Developer II is similar to the Salesforce DEV 501 certification exam, as it includes a multiple choice exam and a programming assignment. Salesforce Certified Platform Developer II tests the knowledge on advanced programmatic capabilities of a professional on the Force.com platform to develop complex business logic. Professionals should be able to model, design, develop, test and deploy programmatic solutions that follow best object oriented programming practices, Apex design patterns and can be reused. To take this Salesforce certification, professionals must have at least 2 years of experience working on the force.com platform. How to make a transition from Salesforce DEV 501 Certification to Salesforce Certified Platform Developer I/II? Professionals who have earlier cleared the Salesforce Certified DEV 501 Advanced Developer certification multiple choice exam and the Salesforce Certified Platform Developer 1 transition exam, can level up in Salesforce development. These professionals can take the multiple choice transition exam and the programming assignment to earn Salesforce Certified Platform Developer II certification. 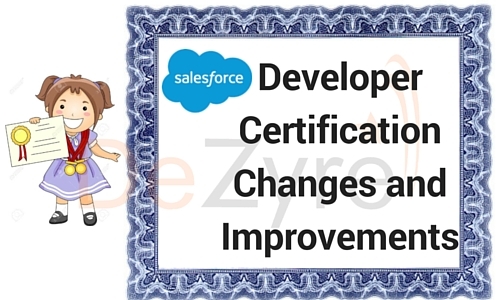 We hope that this information has been helpful and clarified most of the questions you might have about the changes in Salesforce developer certification examinations. DeZyre’s Salesforce Training course curriculum is designed to be on par with the Salesforce developer certification changes to ease the Salesforce certification learning path for professionals. If you have any questions or require any clarification on the new Salesforce developer certification changes, feel free to ask in comments below.